Spacious and picturesque Eden Cottage lies in the quiet Fife village of Ladybank, a few minutes drive from the market town of Cupar in Scotland. 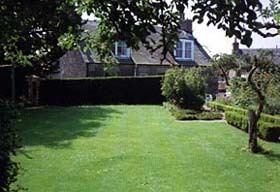 The traditional 19th century cottage has 4 bedrooms and also features a large, walled garden. It is centrally located offering an ideal base from which to tour the beautiful towns and countryside of eastern Scotland. The cottage has four bedrooms, one double, one with two single beds, one with one single bed and one with a large cot. The kitchen is large and well equipped with ceramic/halogen cooker, fridge, freezer, automatic washing machine and tumble drier. There is also a separate dining room and two public rooms, one with colour TV. The adjacent garage and drive provide parking for two cars.